This aircraft came about after the president at the time, President Eisenhower had promised Russia to stop all manned over flights of that country. This was one of the concessions that came from a deal to get back U-2 pilot Francis Gary Powers, whom at the time was languishing in a Russian prison, convicted of espionage, after being previously shot down during one of the last manned U-2 recon flights over Russia. 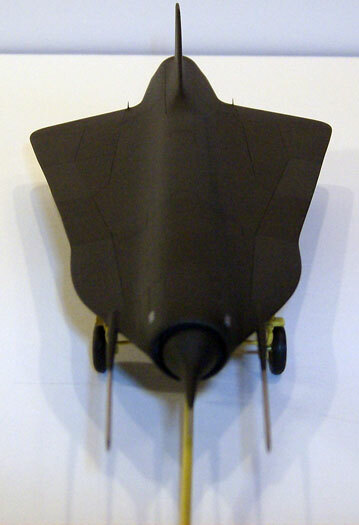 The GTD-21A was built using much of the same materials and technology as the A-12, but it was also smaller and faster. The M-12 was to carry the drone to pre-determined launch area, launch it at altitude, the drone was then to fly a pre-programmed path over the target area, takes its pictures, and fly to a point to drop the recon bay for later recovery, and then the drone was to self destruct. After the loss of both an M-12 and D-21 during a test launch, it was decided to use B-52’s as the new launch platform. This meant some small modifications needed to be made to the GTD-21, thus the GTD-21B. The GTD-21 Drone was my first Vacu-form. 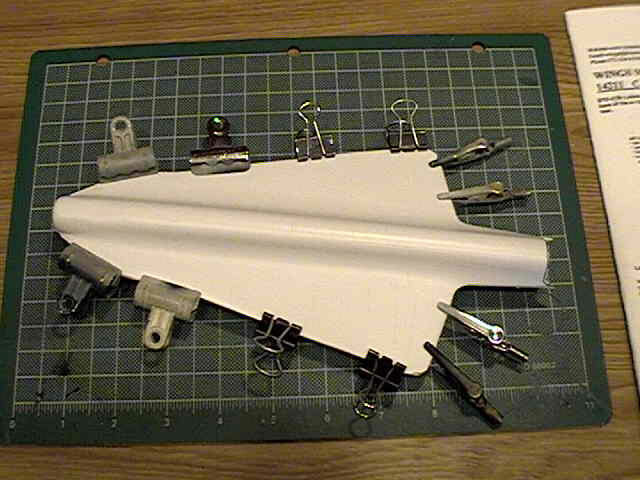 The first one I built, I didn’t use the fairings that the captive test flight Drones had, and painted it incorrectly. The drone itself is fairly easy to build. Considering its size, mine came out a little heavy after all the super glue I ran down the insides of it to strengthen the wings. After building the first Drone in the Silver and Black colors, I decided to repaint it in the correct operational colors (all black), and put the Black and Silver paint on the captive test bird. 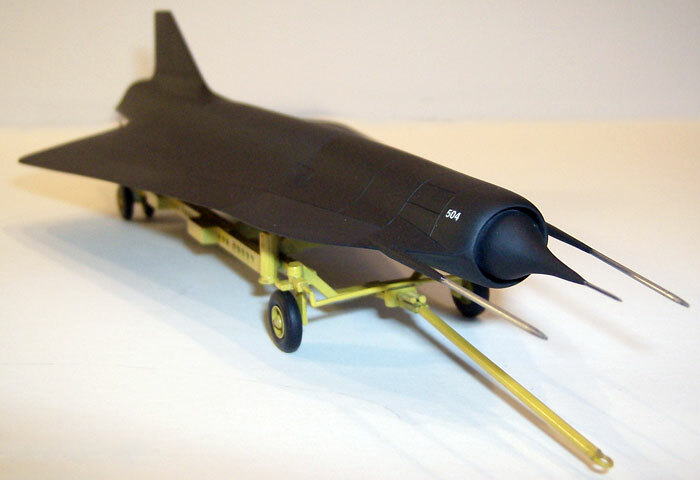 I painted the operational drone in the same manner as the SR-71A, including the slightly different colors, and used dry transfers on the nose. These are the only markings I was going to use, as the real drones only carried their individual number, and some maintenance stenciling. 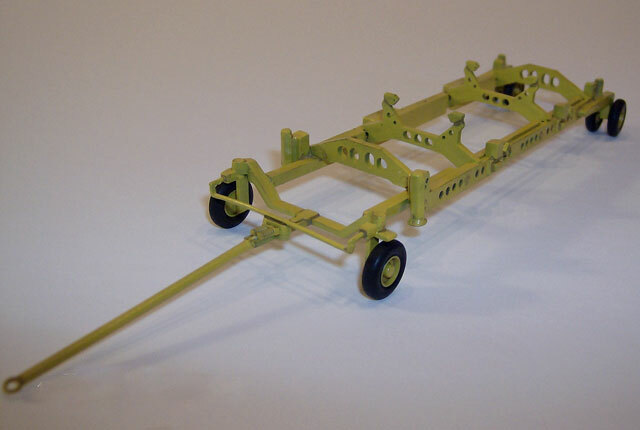 The ground-handling cart for the operational drone was acquired through the “proper supply channels”… ironically enough “secured” from my Testors U-2 kits. I used two of them to make the cart for the drone. 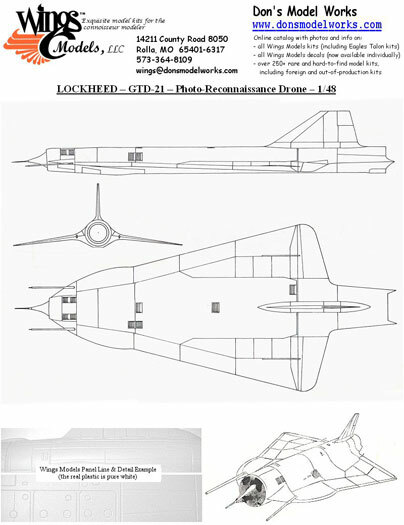 The irony is due to the U-2 and the SR-71 both being Kelly Johnson, and Lockheed designs, and the U-2 and the SR-71 kits are both, Testors kits. It happens that I built the second drone along with the M-21. I picked the aircraft that was used during the captive test flights. For this reason, I built this drone with the aerodynamic fairings attached. 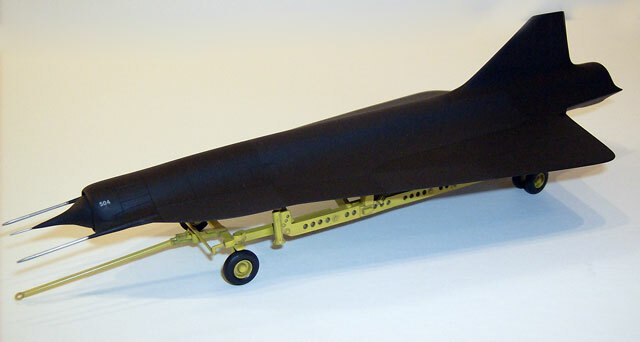 This drone is painted in the NMF, and Black scheme similar to the M-12.